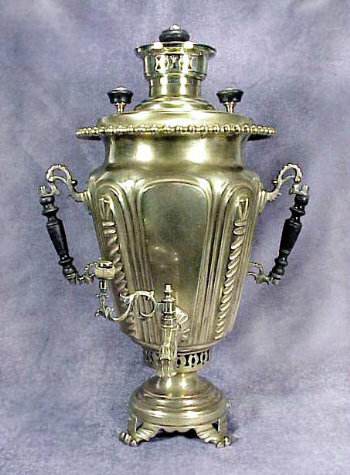 Beautiful spiral flutes adorn the panels of this conical shaped Samovar. Polished yellow brass surface with beaded and pearled upper rim. Vertical folkloric handles and a round skirted base with stylized paw feet. Complete with chimney cap. 4 Exhibition and Design Award seals and Medallions in 1899 • 1900 • 1903. Dimensions: H 19" W 14"